An anti-war demonstration by more than 150 people which caused havoc in Brighton has been severely criticised by police. The protest on Saturday afternoon led to the main coast road being closed. The city's leading police officer has called the protest "unlawful" and "unacceptable". Five people were arrested during the march for public order offences, including possession of a firearm. The protesters attempted to march towards the Churchill Square shopping complex in the centre of Brighton. Police said they drafted in resources from across Sussex on the basis of requests from Brighton traders and community leaders who had been affected by previous protests. After the campaigners were diverted away from the main shopping area they headed for the seafront where police said they tried to block traffic at the roundabout by Brighton Pier and the Sea Life Centre. Traffic had to be diverted away from the main south coast road as a result. 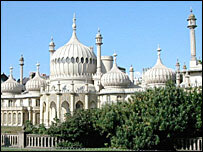 Superintendent Peter Coll, in charge of policing in Brighton and Hove, said the organisers had been offered an alternative route and he was disappointed they had not co-operated. He said: "It has always been our intention to facilitate lawful and peaceful protests. "But closure of the main south coast road and a city centre packed with Saturday afternoon shoppers is unacceptable. "This police operation was successful in terms of preventing significant disruption to the city. "I would urge protesters to talk to us and negotiate an acceptable protest. "I feel they do their cause a disservice by acting unlawfully."